Tweed has been woven from Scottish wool for centuries as one of the warmest, most supple, and hard-wearing natural fabrics in the world. Each individual tweed takes its colors from local variations of fields, moors, mountains, or any rich countryside. The bold checks are designed to break-up the background color to form the most effective camouflage. In much the same way that the ancient Scottish clans have their own individual tartan, the great estates and families of Scotland have their own identifiable tweed, with the colors, checks, and patters signifying certain natural aspects of their lands. 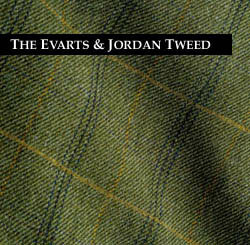 I was honored when Evarts & Jordan contacted me to assist with the design of their exclusive tweed pattern. I have been longing to see a return to the days of an age when no compromise of quality was allowed and the product you bought was built to last, with attention to detail and natural elegance that modern designs and materials often loose. It was a true joy to work with Evarts & Jordan because of their total commitment to quality and their determination to design well made things that function properly, feel good and look good. We worked together for several months. Last fall, we decided to have P&J Haggarts of Aberfeldy weave our tweed. They are one of the finest tweed manufacturers I have seen, and the Royal Warrant given to them further supported our decision. We designed a tweed completely wearable from the grouse moors of Britain, to the vast, green countryside of New England. The subtle blend of colors beautifully sets off the Evarts & Jordan navy blue check to form one of the most attractive, classic, yet individual tweeds found in the world today. To wear the Evarts & Jordan Tweed is to not only enjoy the finest outdoor clothing possible, but to also become part of the romance and tradition of the true hunting life. Lord James Percy lives in Northumberland at his Linhope estate in the Cheviots. Reputed to be one of the very best shots in Britain, he is a driving force on the conservation front. His efforts and commitment to the conservation cause have seen a remarkable transformation in the populations of wild grouse and partridges. A member of the Games Conservancy Uplands Research Committee, his dedication has inspired us all. 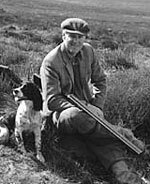 At Evarts & Jordan, we are honored that Lord James Percy has collaborated with us to design our tweed, and we are thankful for his efforts at striving to uphold traditional sporting values.